Germany is Europe’s economic powerhouse, with a reputation for efficiency, order, and low unemployment. But since the end of 2015, the job market in the neighboring Czech Republic has been even stronger. Data published this week showed that the Czech Republic’s unemployment rate was a mere 2.9% in June, compared with 3.8% in Germany and 7.7% in the European Union overall. So how does this former communist country do it? Firstly, and perhaps unsurprisingly, labour is cheap. The average hourly labor cost in the Czech Republic in 2016 was just €10.20 ($12.07), well below the EU average of €25.40. But this doesn’t fully explain the country’s low unemployment because others like Bulgaria, Hungary, and Poland, have even lower labor costs. Also, wages in the Czech Republic have been rising pretty steeply. In the first quarter of 2017, nominal wages increased by 5.3%, or 2.8% adjusted for inflation. 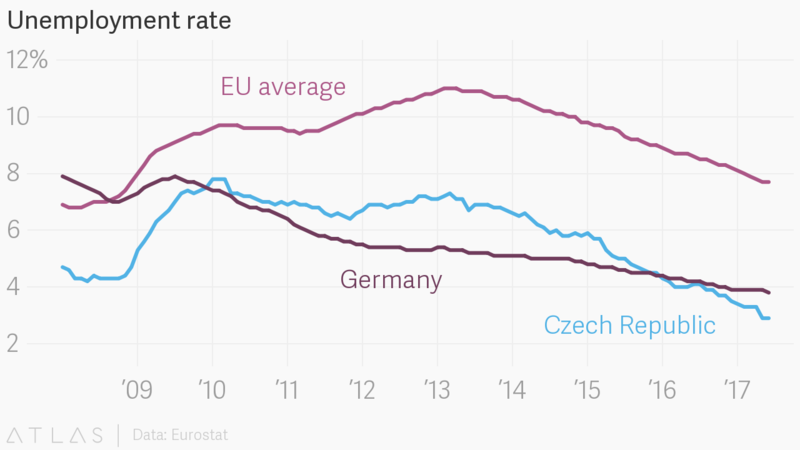 What’s more, the Czech Republic owes its success to factory jobs, no small feat these days. The central European country’s manufacturing industry accounts the largest proportion of its economy compared with others in the EU, and represents more than a third of all employment. The production of cars, by companies like Toyota, Peugeot, Citroën, Škoda, and Hyundai, is now a crucial cog in the Czech economy. Government incentives dating back to the 1990s, which include tax breaks for new companies and cash for creating new jobs, attracted high levels of foreign investment, boosted further after the country joined the EU in 2004. According to David Marek, chief economist at Deloitte in Prague, the nation’s unemployment rate is low for two main reasons. First, assembly plant jobs have been relatively easy to create because they are cheap and government incentives have made the Czech Republic attractive to global manufacturing companies. Second, the Czech business cycle is closely connected to the economic health of the EU. When Europe is doing well, the Czech Republic does even better, Marek says. And right now Europe is doing relatively well. The region’s economy grew 2.2% in the second quarter versus the previous year, roughly the same as the US. But the roots of the Czechs’ recent success may store up trouble for the future. High wage growth is a pressing concern. Deloitte’s Marek says wages are rising because of labor shortages, which prevents the economy from growing even faster. Like many countries, the Czech Republic also faces an aging population. Red tape and bureaucratic obstacles make it difficult for companies to hire foreign workers to fill open positions. Marek says the country can’t afford wages to increase faster than productivity. The Czech Republic is “the assembly center of Europe, not the knowledge center,” he says, meaning it has a lot of inexpensive, low-skilled jobs but isn’t developing the skills and knowledge to meaningfully increase productivity with more sophisticated processes. To keep unemployment low, the government needs to change its decades-old incentives system to encourage the creation of high-skilled jobs, namely by improving the education system. While there is a high rate of secondary education, relatively few people go on to get university or vocational qualifications. The most obvious risk to dependence on assembly-line jobs is looming: automation. According to an OECD study released last year, the Czech Republic faces the most widespread risk of job losses from automation in the group, along with neighboring Slovakia, a similarly factory-heavy economy. Before the Czech Republic is hailed as a paragon of manufacturing-driven employment success, it’s important to consider the long-term consequences it might face for not encouraging more foreign workers and perhaps relying too heavily on jobs that will soon belong to robots.